Passing the Mississippi written exam has never been easier. It's like having the answers before you take the test. Our step-by-step process is easy to follow, making your license application a breeze! Get yourself prepared BEFORE you visit the MVL. You must apply for a MS driver's license in person at a DPS office. You will need to pass the vision, written knowledge, and driving tests, and pay the required fee. 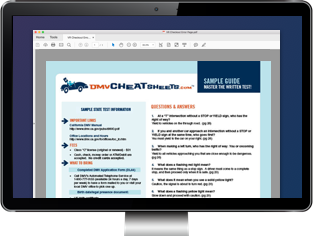 This page will give you all the information you need to apply for your first Mississippi driver's license from the Department of Public Safety (DPS). NOTE: If you're 17 years old or younger, please see our Applying for a New License (Teen Drivers) page. If you've recently moved to Mississippi, you must transfer your out-of-state driver's license to the state within 60 days of arrival, and register your car within 30 days. A completed Driver's License Application Form (Form DL-41). Surrender your out-of-state driver's license. Provide your Social Security card. Pay the driver's licensing fee. NOTE: A Mississippi DMV agent will verify your driving record before issuing your new driver's license. As long as your license from another state is valid you may be exempt from the written test and driving test. If you don't have your out-of-state driver's license, you can still obtain a MS driver's license by including an Affidavit of Inability to Surrender (available at the MS DPS office) with your application. You will need to have your signature notarized on the form. Regular Class R: For operation of non-commercial vehicles. Commercial driver's license (CDL): See our Applying for a New CDL page for more information. Motorcycle endorsement: Designated on your regular driver's license or your CDL. See our Motorcycle License page for more information. If you're under 17 years old, your parent or legal guardian must sign your form. NOTE: As of August 1, 2014, the Mississippi DPS will no longer accept card scans and printouts. A passing score on the vision screening. Acceptable proof of your Mississippi address, if you're over 18 years old. Those under 21 years old may use their parent residency information. Payment for the driver's licensing fee. You will also have to pass both the written knowledge and road tests. NOTE: If you're a non-U.S. citizen, you will need to provide additional documents. You may also be exempt from needing a Social Security card. See below for more information. Before your MS driver's license will be issued, you must pass both a written knowledge exam and a driving test. The questions in the written knowledge exam will be based on information found in the MS Driver's License Manual. In addition, the DPS offers an app to help you study. If you want the ultimate in preparation for the written exam, try an online practice test from our approved partner. During your driving test, your examiner will grade you on how well you can operate a motor vehicle. You will be tested on your ability to handle the vehicle, obey road rules, and use the proper signals, among other things. If you fail either the written test or the driving test, you must wait until the next day to re-take it. If you fail 3 times, you will need to wait 30 days until you can re-take it. Payment must be made by cash, debit card, or credit card only. Checks will not accepted by the MS Department of Public Safety (DPS). NOTE: Different license validity periods and fees apply for teen drivers. Please visit our teen licensing page for details. If you're a non-U.S. citizen, you must meet all of the standard requirements for obtaining a MS driver's license, with the exception of providing a Social Security card. Your driver's license will only be valid for as long as you are legally allowed to stay in the U.S., or for the default length of 4 years. Birth certificate translated by a state-run university or approved translator. Alien resident card (if applicable). Application for a Mississippi driver's license if you're 17 years old or older. Looking for Applying for a New License (Drivers 18+) in another state?